A well equipped and furnished townhouse. Air-con in bedrooms. Sleeps 4. Lounge boasts 2 comfortable leather sofas. 2 bathrooms. South facing furnished patio garden, sunny all day with pot plants/shrubs which overlooks an attractive landscaped area with many plants, shrubs, palm, olive, orange and lemon trees with a pine ravine beyond. Balcony off master bedroom with table & chairs ideal for a nightcap or early morning coffee. Rooftop terrace with sunbeds, table & chairs for private sunbathing & dining with panoramic views of Alicante bay and the mountains. 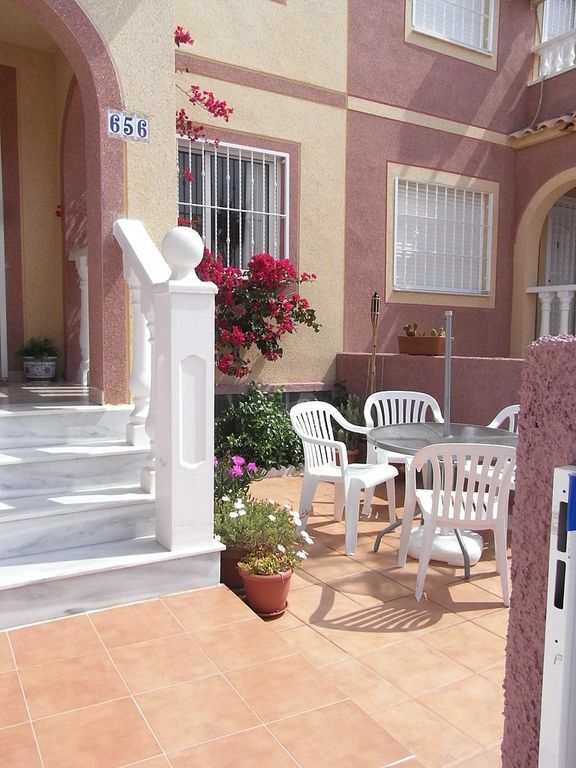 The property is 10 mins from Alicante and 45 mins from Murcia airports. The house is very private with no other properties in front - car parking outside. The house has British TV, DVD, MP3 Dock, CD & radio. There are DVDs, CDs, books and games for your use. Gran Alacant is well positioned with a wonderful beach a short walk away. Alicante & Santa Pola are a short ride away, Benidorn & Torrevieja an hour away. Bathroom 1 with bath / shower, WC, wash hand basin, bidet and large illuminated mirror. Bathroom 2 with shower cubicle, WC, wash hand basin and large illuminated mirror. In bedrooms, Ceiling fan in lounge. Bathroom only, no beach towels. Through lounge/diner. Ceiling fan. 2 Leather sofas. 32" LCD TV, DVD player, MP3 Dock, CD player, radio. Dining table and chairs. Pine dresser housing drinking glasses and a selection of board and other games. Shelving with books and CDs/DVDs. The kitchen is well equipped with ceramic hob, oven, microwave oven, fridge/freezer, washing machine, dishwasher, electric grill, kettle, toaster and plenty of crockery and cutlery. The Costa Blanca South is a golfers paradise. There is easy access by car to many top golf courses - Alicante, Villamartin, Royal Campomar, La Finca, Alenda golf, to name a few. Many courses are within 20/25 minutes drive away. More specific course details can be provided on request. Notes on accommodation: Both bedrooms are air conditioned. Fans are provided in other rooms with a ceiling fan in the lounge. No smoking anywhere in the property and no pets. Outside: The shared swimming pool with kids pool is a very short stroll from the house. A lifeguard is on duty during peak times. Shades and sunbeds are available for hire at the pool. Showers and WC are provided. The pool garden area is grassed and carefully planted out with both palm and olive trees. There is a furnished patio garden at the front of the house with pot plants and shrubs. The patio overlooks an attractive landscaped area with many plants, shrubs, palm, olive, orange and lemon tress. There is an uninterrupted view of the pine ravine. The roof terrace is furnished with sun loungers, table and chairs. A BBQ is provided on the roof terrace for alfresco cooking. The area is serviced by a road train (looks like a steam loco) it takes a big loop of the area stopping at the beach, bars, shops and the commercial centre. Great fun for kids. Also a short walk from the house is a public park. Here there is a soft play area for children, adult exercise equipment and a snack bar. Utility Room: Covered gallery off the kitchen with fridge/freezer and additional kitchen storage. Cleaning / Towels / Linen / Maid service: Quality towels (beach towels not provided) and bed linen are included in the price. The house will be cleaned at the end of stay. A cleaning fee of 50€ is payable at the start of your stay on collection of the house keys. Other: Spacious roof terrace with night lighting offers alfresco dining with outdoor furnishings ie table, chairs and sun loungers. Spectacular views at sundown. There is a furnished patio garden at the front of the house with pot plants and shrubs. Lovely house with all you could possibly need. Very well appointed and maintained, spotlessly clean. Had a very enjoyable stay here, great location, bars and restaurants 5 mins walk away, supermarket 5 mins away. Meaning car not essential. Beautiful swimming pool 2 mins walk away. Thoroughly recommended. A real gem. we stayed here two years ago, and it was wonderful from start to finish. there was two bedrooms, beautifully clean and everything you would need. The locals were extremely helpful and kind and gave great advice about where to go to eat and local amenities. the beach is so close and beautiful. tv with english cartoons were very important for the kids whilst we were cooking dinner and the pool has a lifeguard-(important to note there is a deep end!) perfect for people with small kids or couples. there is a bath, place is fully tiled, and there is even stairgates. I got a really bad burn with a cup of camomile tea and only for Lizzy-Im sure I would have a terrible scar. Instead I have memories of a wonderful family holiday in a beautiful quiet house close to the beach and has access to the pool that was well equipped and extremely well serviced and supported. The house is really beautiful and has everything you need. I particularly loved the roof terrace where you can sunbathe in the day and watch the sun set over the mountains in the evening. The pool area is very pretty and clean. The walk back from the beach is steep but is well worth the trip. Booking was easy and Lizzy who brought the keys was extremely helpful. I had a fantastic time! This was our third trip to the property previous visits in May 13 October/November 13. The property is just as described with all the conveniences for a two bedroom house. The front patio and roof solarium are nice features where you can relax. The property overlooks a ravine to the front with good views to the south southwest and the mountains over which you can watch the sunset. The views from the roof extend to the sea and Alicante. Many restaurants and shops are within walking distance. Market once a week. Communal swimming pool and lawned area only minutes away. The landscaped amenity to the front of the property puts the property in one of the best areas of the Urbanisation. The beautiful local beach (Carabassi) is a short walk away. Buses and a local road train are also available to reach the beach. It is a blue flag sandy beach with sand dunes and pine shaded areas with picnic and BBQ facilities. Adjacent to the beach there is also a tranquil nature reserve (El Clot). For the more energetic there is plenty of activities such as diving, windsurfing, fishing, paragliding and sailing. There are dozens of easily accessed beaches along the Costa Blanca. Alicante airport is 10 minutes and Murcia airport 45 minutes away by car. We recommend car hire to our guests in order to maximise the holiday experience in this wonderful region, however this is not essential because once at the property there is an excellent choice of shops, restaurants and bars. For those not choosing to hire a car there is an excellent bus service to many destinations and reasonably priced taxis. Santa Pola, 10 minutes south of Gran Alacant, is a traditional Spanish fishing village, which offers beautiful local cuisine and shops. Every Monday and Saturday hosts a wonderful fresh produce market. Alicante city is 15 minutes north and offers everything expected in a modern city- shopping malls, hypermarkets, the modern marina is home to many exquisite restaurants. Benidorm is 40 minutes north on the motorway with many family attractions such as Terra Mitcica, Aqualandia and Mundamar. Many shops including a pharmacy, banks, bars and restaurants are within walking distance of the accommodation. A supermarket is a short stroll away this has fresh meat, cheese and fish counters. There is a local street market offering fresh produce, clothing, leather goods and other items each Thursday near the shopping area. There are numerous restaurants catering for all tastes. A commercial centre (about a mile away) has first class international cuisine with numerous shops, ice cream parlours, children's soft play area, etc. Booking Notes: Families & couples only. Minimum age for couples 23. No single gender groups. A deposit is required on booking, starting at £100 for 2 guests. To keep a high standard this is used as security against loss/damage. The deposit is refunded (less deductions if applicable) after the house has been inspected. Guests are advised to arrange insurance as we accept no liability for injury or loss. Changeover Day: Please contact us to discuss your requirements. We will try accommodate mid week starts to take advantage of low cost flights. Access is available from 2pm on the day of arrival and the property must be vacated by 10am on the day of departure. Notes on prices: Prices are for the property per week in UK pounds. A 50€ cleaning fee is payable on key collection. A late arrival fee of 15€ is charged for arrivals after 10 pm. Please email for details for long term rentals.